Zombiehånd performance by Anne Nora Fischer and Anna Moderato. Photo by David Stjernholm. Anne Nora will present parts of their performance practice with an emphasis on what they call world making. 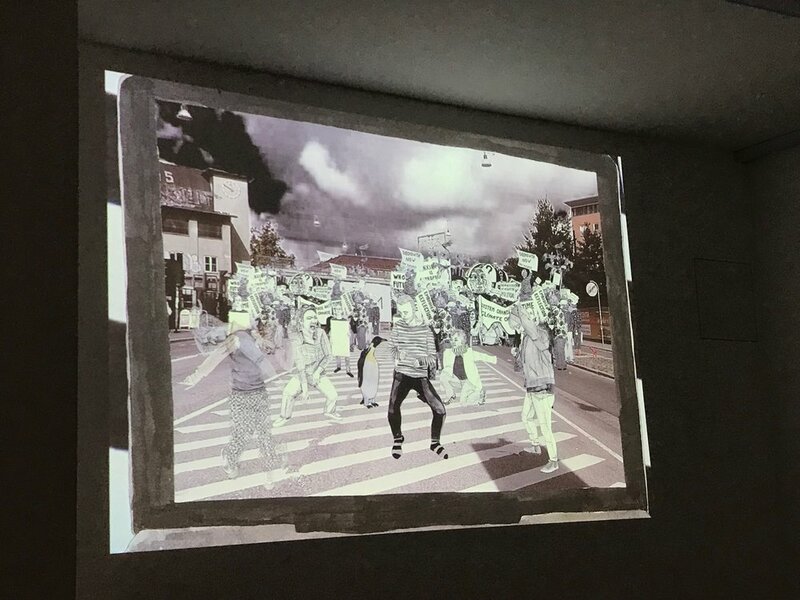 Mo will present their practice; a practice often driven by political questions, frustrations, depression, as well as an enthusiasm for drawing, protest, garbage, and animation. By world making Anne Nora means the construction of common sense and logic within a performance. This will lead to a talk about the structure of the scores, the collaborative generation of material and the play with different levels of performativity and audience perspectives. The works are performed by both dancers and untrained performers and deal primarily with questions about normality, social construction and control. Norms, Social Construction, Climate, Ecology, Everyday, Anxiety, (Queer) Futures, Protest are key words for Mo: How do climate change discourses form imaginaries about potential futures? How do catastrophe imaginaries connect to everyday life?How to form community as a survival strategy? How to stay soft despite circumstances? How to meet across differences? How to mess up? Open to all, no RSVP necessary.